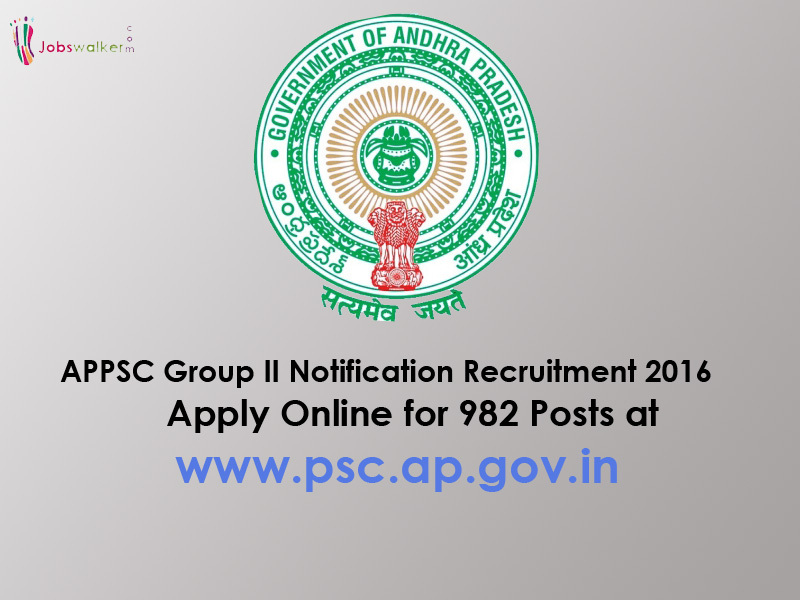 APPSC Group II Notification Recruitment 2016 Apply Online for 982 Posts at www.psc.ap.gov.in: ANDHRA PRADESH PUBLIC SERVICE COMMISSION HYDERABAD NOTIFICATION NO.18/2016, Dt. 08/11/2016 GROUP-2 SERVICES GENERAL RECRUITMENT. Candidates who are looking for govt jobs in ap 2016-17 here the notification released. Applications are invited On-line for recruitment to the posts of Group-II Services. 1. Municipal Commissioner Grade-III in A.P. Municipal Commissioner Subordinate Service. 2. Asst. Commercial Tax Officer in A.P. Commercial Taxes Sub- ordinate Service. 4. Deputy Tahsildar in A.P. Revenue Subordinate Service Posts 253. 5. Assistant Labour Officer in A.P. Labour & Employment Sub- ordinate Service Posts 08. 6. Assistant Development Officers in A.P Posts 23. 7. Handloom & Textile Department Posts . 8. Extension Officer in PR & RD Department. 9. Prohibition & Excise Sub Inspector in A.P. Prohibition & Excise Sub-Service. 10. Assistant Section Officer (GAD) in A.P. Secretariat Sub. Service. Educational Qualifications: upper age limit raised up to 8 years i.e. from 34 to 42 years Must Possess a Bachelor’s Degree from any University in India more info check an offical website. Age Limit: candidates Relaxation of age SC/ST and BCs, Physically Handicapped, Ex-Service men, N.C.C, following cases details on official notification. One Time Profile Registration Direct Recruitment or Departmental Test.